BANGKOK: The Interpol “Red Notice” for Red Bull scion Vorayuth “Boss” Yoovidhya, a hit-and-run suspect wanted by Thailand, has disappeared from the Interpol website. It was unclear when the notice – a worldwide request to find and arrest an individual pending an extradition – went missing from the website...and for what reasons. But there was immediate speculation that powerful interests had intervened on Vorayuth’s behalf. Interpol declined to discuss individual cases but told the Bangkok Post that generally a notice could be lifted if “the suspect has been arrested and extradited or died, the country which requested it has withdrawn its request, the judicial authorities in the country behind the notice have withdrawn the national arrest warrant against a suspect, the notice is the subject of an appeal, or the notice has been cancelled or the status of the notice has changed from public to restricted”. Thai police said in late August that the international police network had issued the red notice for Vorayuth, now 33, after he repeatedly failed to meet with prosecutors. The notice was on the Interpol website until recently. Thai police spokesman Krissana Pattanachareon said today (Mar 15) that Thai police had no idea why the notice was no longer there. “It’s entirely up to Interpol. We can’t intervene because each country has different laws,” he said. Col Krissana confirmed that Thai police had not sought a change from “public” to “restricted” status for the notice. He added that this was standard practice for such cases. Before dawn on Sept 3, 2012, a black Ferrari driven by Vorayuth slammed into a policeman on motorcycle, dragging his mangled body along Sukhumvit Rd, before speeding away. 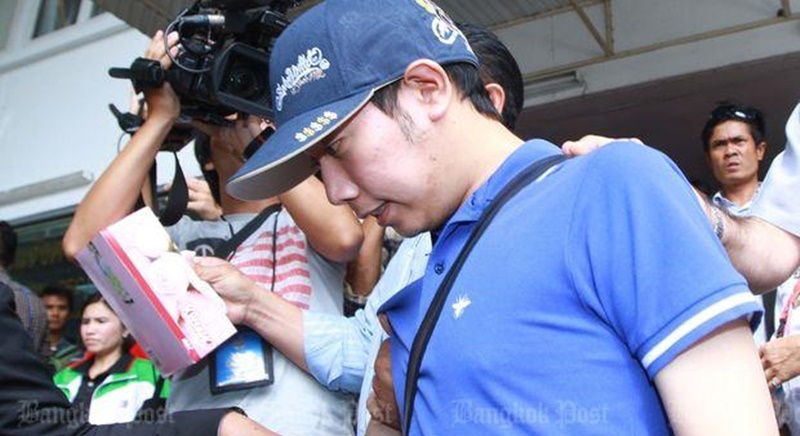 Vorayuth delayed hearing the charges seven times, citing various reasons. It was not until April 27 last year that prosecutors finally charged him with reckless driving causing death and failing to help a crash victim. The government cancelled his passport after he flew out of Thailand on his private plane two days before he was due to face the charges. The speeding charge was dropped as its one-year statute of limitations had expired. The second charge – failing to stop his car to help a crash victim – expired on Sept 3 last year. The third and most serious charge of reckless driving causing death will remain pending until 2027. It should have said "the police did what they usually do" They did all they could, well i guess that just shows the level of their ability. “Thai police did all they could to bring the suspect to justice." Is it April Fools Day already- you're not fooling me! They seem to be 'working hard' with Khun Leopard as well. When the Junta starts to understand that worldwide 'different laws' in other countries are more about democratic settings? Long time this Junta got benefit of the doubt, but that is over now. Mr Thanathom Juanggroongruankit, who stand for democracy, is now shadowed by NCPO, to make sure he not assembles with more than 5 persons!